Hello Kitty and friends have cornered the market on cute for four decades, and it’s easy to see why: Sanrio’s simple yet charming style makes for easy application to almost anything. Racing games are certainly not out of the question, and Hello Kitty Kruisers takes the obvious whimsical route through the genre, as much as our Fast and the Furious crossover fanfics have tried to champion otherwise. But while adorability is expected in force, how well does the racing element show up? 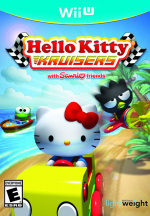 Hello Kitty Kruisers features 10 playable characters from Sanrio’s roster, four which are unlocked. In addition to the titular Kitty, favourites including Keroppi the frog, My Melody the rabbit, and Badtz-Maru the perpetually non-impressed penguin are also selectable. Each comes with two racing outfits on top of what they commonly wear. 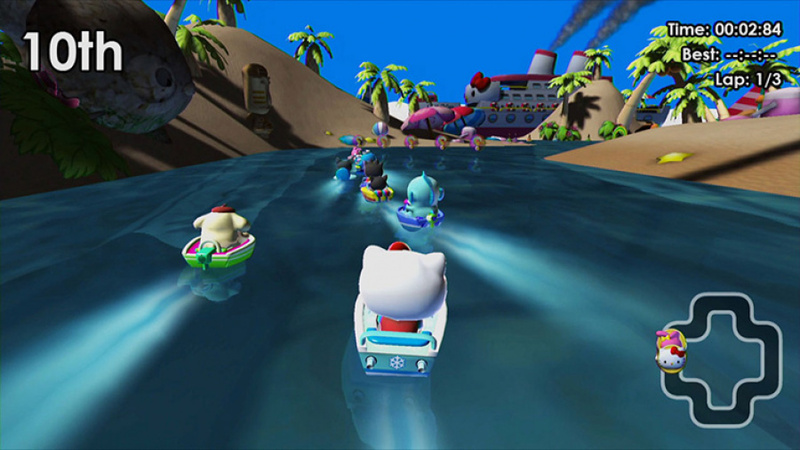 The 12 tracks in the game cover five themed areas and range in use of cars, boats, and planes. 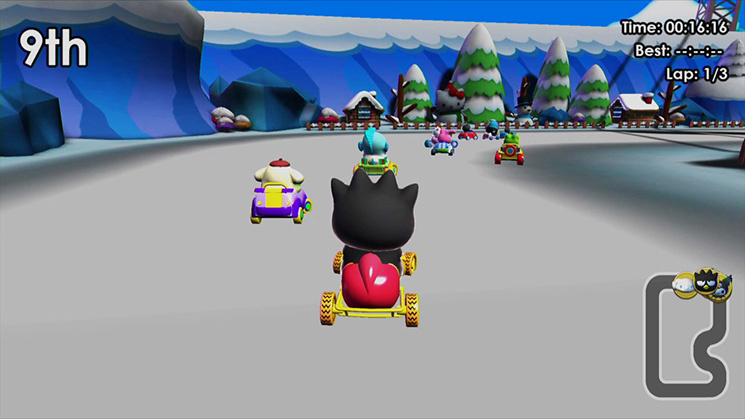 Unlike Diddy Kong Racing, you can’t choose which mode of transportation to hit each track with. You’re stuck with whatever the track was designed for, but can choose from 10 models of that vehicle, each with a choice of two alternate paint schemes. Feel free to choose whatever character and vehicle you want, as there are little to no discernible differences between them; this is your first omen regarding the depth of the racing experience here. The second comes when you realize stats wouldn’t matter at all, anyway. Kruisers’ races are extremely easy to win, even accounting for the target audience. The tracks are of simple geometric design with often little in the way of obstacles and a width that makes 6-lane superhighways feel snug in comparison. Controls respond very well, with every method offered on the Wii U available except the Wii Remote + Nunchuck combo. The Wii Remote itself is a go, probably because tilt controls can be used, and they are mostly serviceable here in the way that you can drive a bus through the desert and probably not hit anything. Sadly, for how basic the courses are, the AI seems woefully incapable of handling it. Computer-driven racers bumble about, bonking off walls from the first turn. You can use the maps on the TV or GamePad to see which of your favourite characters has become permanently stuck in a corner or is inexplicably driving the wrong way, since they’ll all be behind you, anyway. Every course is easily winnable on the first try and there are no difficulty settings to adjust for challenge. The usual item pick-ups are available, including pie-shaped missiles and traffic cone mines, but there’s little use for them from your reserved location in first place. Up to 4 players can play locally on split-screen, which at least has hope of real competition, but online play is not an option. A single-player “Adventure” mode offers 20 challenges that cycle between hot laps, gate-clearing, and collecting apples and cupcakes on the tracks; stars won here and in the Tournament will unlock characters and vehicles with no fanfare whatsoever. New options will just be there when you go to the selection screen, as if they had tried to sneak in late. Presentation is overall pleasant, with vibrant, colourful, yet incomplex aesthetics that serve the Sanrio universe well. The music is sweet and bouncy, sounding like cheerful throwbacks to music of the 16- and 32-bit eras. There is the occasional rough texture, though, or the fact that boats don’t cause any reaction to water and make a rubber-squealing sound effect when turning sharply (there are no power slide boosts, by the way). Also, what is likely the strongest selling point of the game, the Sanrio license itself, doesn’t feel put to use as widely as it could have. Characters are fully mute and do almost nothing to convey their personalities. Fans wanting to know more about the characters will also find nothing here. Heck, just some artwork when loading would have been nice, but all you get is a monochromatic screen with a loading bar. The wail of sirens grew closer, the 9-car pileup on the gentle curve in front of them sending an S.O.S. of smoke into the night sky. Cinnamoroll flailed down the street, his floppy ears on fire. Her deep black eyes stared back at him, unblinking. Dominic sighed and shifted his car into gear. And with his engine’s roar, he was gone. She watched him fade into the distance, fists (as best as she could make them) clenched in indignant and kawaii fury. seeing those visuals i thought this would be a bad looking wii game. but it is in fact an extremly bad looking wii U game !! @6ch6ris6 What can I say? I actually found the look of the game charming in its own way. Your mileage may vary. That's a shame. I'm pretty sure Bandai-Namco did some decent Hello Kitty games on DS. Sanrio really should be more concerned with the quality of the use of its license. This is the price the Wii U must pay for no major 3rd party. Yeah every console has its fair share of shovelware, but here it's particularly glaring. @TimLatshaw Do you know this is a $2 mobile phone port? How much cost this one? Your crossover fanfic intrigues me. And that's a sentence I don't say very often. 10/10 Just for the fanfic at the end of the review! @TheN64Dude Really? REALLY? I'm going to lie down and have a think about life. The character models look kinda good, but the other graphics? No. It looks like a bad iOS game. Hm... nothing out of the ordinary. Ripping off kids must be pretty damn lucrative. Why do developers have to take dumps on Nintendo consoles?! I don't want to look at Mario Kart 8 after seeing this game. IT BE THE RACING GAME YOU ALWAYS WANTED, IT'S THE RACING GAME OF THE YEAR, 5 YEARS IN A ROW!!!!! Well as I said in another article, some gaming company has to release kid console games no matter how bad it is. Nintendo can manage that without a doubt as they've been doing it for over three decades. Sony and Microsoft won't do it because they're scared it'll hurt their image. Obviously teenagers and adults won't enjoy this game, but If a 5 year old kid does then it's worth it. Much better than a 5 year cursing and swearing on COD. The great thing about Nintendo is that they're not fully focusing just on "Bang, bang! You're dead." games. They've always been focused with "family and friends getting together and have fun" games. Problem is we're becoming more anti-social now that we have Internet and online play. How I would love to play Super Mario Kart on the SNES with my older brother again. Just the game Wii U desperately needed!!! Mario Kart? Psh, it's all about the KITTEH!!! errrrr... is this a wii u game??? If it would cost between 1-5 dollars, I would say it is OK for a kids game. This game targets the 4 y.o. to 8 y.o. population. As such, I think this is perfect for those young kids (or drunk adults, lol). As for the price, I don't care if this game was $1 or even free on smartphone, you can't expect the developer to charge the same on a console! Comparing smartphone business environment vs that of console is comparing apples to oranges. There's too many different dynamics and variables between the two business models to expect companies to charge only $1 or $2 for a game on both devices. I do think $20 is a bit pricey, but $10-$15 would've been a fair price to charge for this game. This is definitely a rip-off for parents looking to buy something fun for their small children. I don't have any problem with a simple, cutesy racing game for the little ones, but this sounds rushed, lazy, and incomplete... While I know we're used to licensed properties bringing bad games, this is not acceptable. I can see this as a $5 time waster for the little ones, but for a $20 purchase? "What's hilarious is that everyone on Miiverse thinks this is way better than Mario Kart and Mario Kart 8"
@SanderEvers I would! It's nice to have a spare blue game case just in case I need to replace one. And how old was the little girl you had play this game and give you their opinion? Or is this just another review by a player who is not part of the target audience? This is what makes it hard to buy video games for children. Even the best gamer websites are full of reviews by 30 year old men who think they can just somehow imagine what they would think of a game if they were a 7 year old girl, like that's the same thing. The best movie reviewers take their kids or a neice or nephew with them to the latest Disney flick. Gamers should hold that standard as well. By the way, my little girl thinks this game is the cutest thing on the entire planet and plays it all the time. I'm so glad I ignored these adult gamer reviews and bought it. They're still making N64 games? Alright whose idea was it to make this shovelware PSP exclusive and release on my birthday! Is this 60fps or 30fps? @luckerL I'm pretty sure this is PSP. Looks good for the system. Maybe not the best, but among the average-looking ones. It is indeed a shame. Sure graphics don't mean everything in games. Sometimes gameplay is more important. The game's box title look almost like a dedicated homage to Diddy Kong Racing. 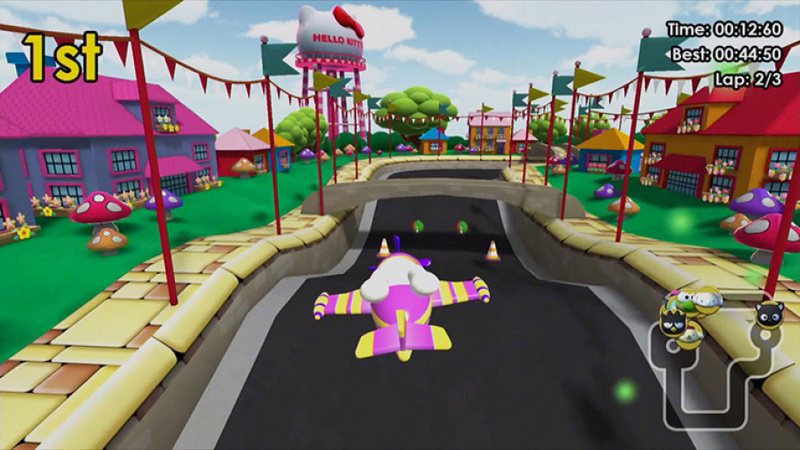 And it would be nice to see a Diddy Kong Racing type game with similar mechanics come out. 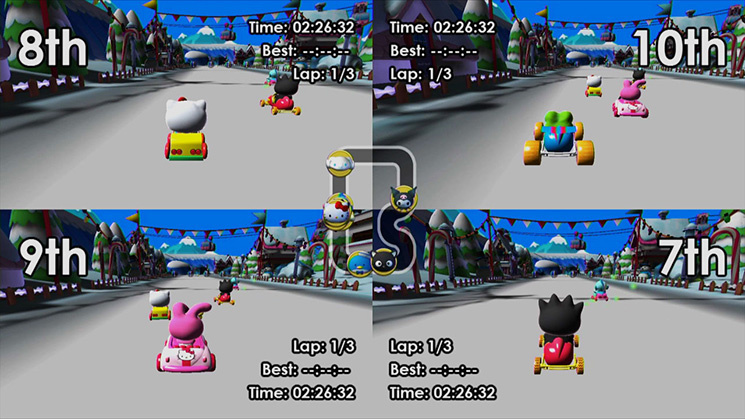 We have seen Sonic All Stars Racing and you cannot really say that game was terrible or even bad. It was quite fun and intense and did things better than Mario Kart. But this is just a shame. I'm no Hello Kitty, but that must be very disrespectful to the series. This is one of the worst games ever to be made for Wii U. Filled with so many errors that even your good kids will be tempted to throw the gamepad at your head, when the boat they are controlling get stuck in the middle of river or in the land. There are some bad 3rd party games for the Wii U but this is the worst <1 / 10. They could have added more characters and good gameplay elements.